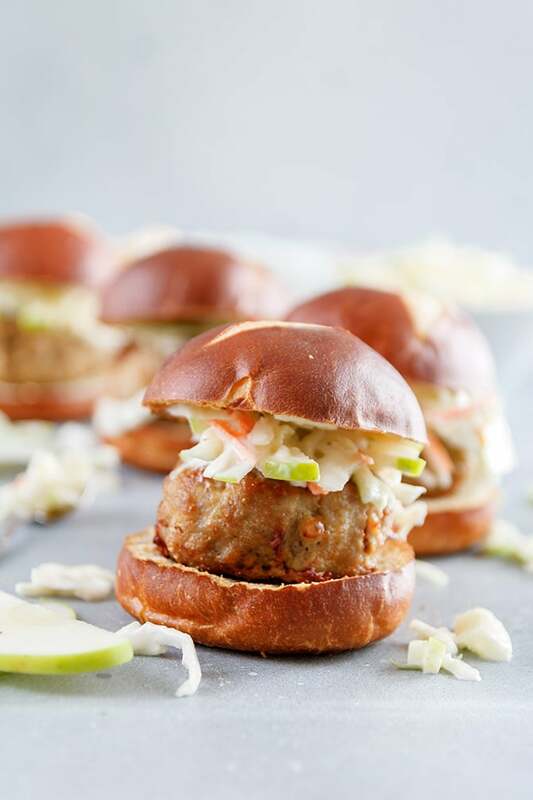 Juicy turkey burgers made into bite-sized sliders, topped with a green apple coleslaw, and served on a mini pretzel bun. I have been having some serious writers block lately. For some reason I just cannot think of anything to write. It might be because I have so much going in right now with the new baby and my mom being here that I just don’t have time to think about anything else. Haha. But I have mentioned before that the writing part of blogging is the hardest thing for me. When I was a kid going through school, writing and English were my least favorite classes. I never failed them or did terribly but it literally took me until the deadline of the paper to pump it out and just get it down and hand it in. I do remember every time I turned in a paper I thought for sure I was going to get a failing grade but it was always the opposite. Maybe I am a good writer but I just don’t like writing? Meh… I dunno. I absolutely love blogging but I love the back-end with coding much better. I also love creating and trying new recipes all the time. And I love love the photography and am always trying to improve upon that. It’s also super hard for me to write “this is delicious” all the time and all the words to describe how something is. I just don’t think I’ll ever be that person that will love writing about food. I mean, I struggle to get the “required” 300 words with each blog post. I do however love making and taking pretty pictures of the food. Anyway, enough of my blathering. Burger sliders are one of my favorite things to make. They cook so quickly and even if you eat 2-3 of them you don’t feel like you’re gourding yourself with a huge burger. They are also the perfect little things to make for a backyard BBQ or a get together. So made these recently for a little get together we had to show off the new baby and everyone loved them. Preheat broiler with oven rack in top position. Spray baking sheet with nonstick cooking spray or line with aluminum foil. In a large bowl, combine ground turkey, cumin, salt and pepper and mix well. Divide and shape into 8 slider patties. Arrange sliders on baking sheet then broil for 2-3 minutes per side or until done. 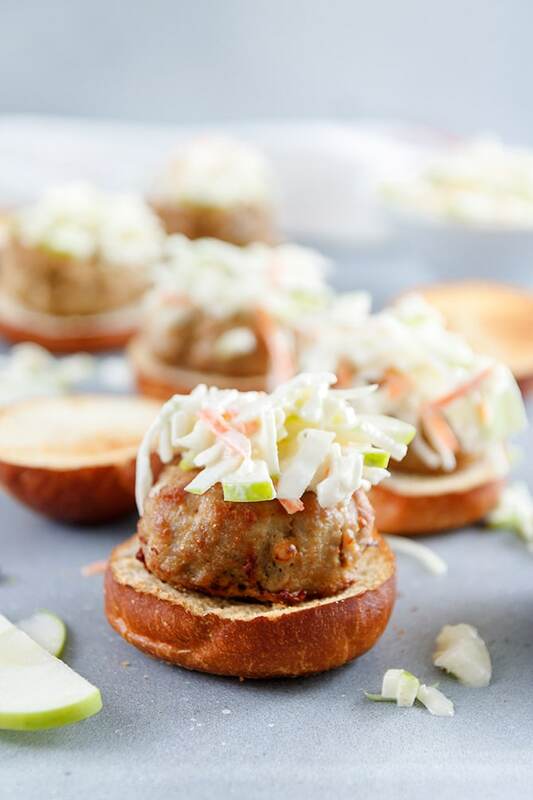 While sliders are broiling, add coleslaw, apple, mayo, vinegar, and lime juice in a medium bowl. Toss thoroughly to combine. Top each pretzel bun with turkey burger then coleslaw mixture and top half of bun. Serve immediately and enjoy!